A while ago I pointed out that not everyone saves taxes from their home mortgage interest payments. One often overlooked facet of the tax deduction of home mortgage interest is that the interest paid will go down over time and eventually not warrant itemization. If you look at a home mortgage today for say $200,000 and get a 5% rate then that would equate to about $10,000 in loan interest. That would make a pretty big tax deduction. But over time that $10,000 will seem like a smaller number and eventually it will probably be much lower than the standard deduction and not warrant itemizing your taxes. Today that $10,000 deduction might equate to a $1,500 tax savings if you're in the 15% bracket but over the life of a 30 year loan it will not amount to nearly as much savings. It would seem at first glance that you're getting 15% of your interest back in the form of tax savings. That may be mostly true for the first year but your tax savings will go down over time. To illustrate this lets look at an example. Say you make about $60,000 a year and you buy a house with a fixed 30 year mortgage of $200,000. Your interest rate is 5% and the property tax is about 1%. For the sake of the example I'm going to arbitrarily assume that you put about 10% of your income between charity contributions and state taxes. If you itemize your taxes then you'd have about $10,000 in mortgage interest, $2,000 in property taxes and $6,000 combined between charity and state taxes. That would add up to total itemized deductions of $18,000. The standard deduction for a married couple is $11,400 for 2010. So compared to the standard deduction you have $6,600 extra in deductions if you itemize. Since you're in the 15% bracket that equates to a $990 savings on your tax federal income bill over the standard deduction. This revels the first detail of the tax savings. You don't necessarily get the full 15% back but instead you get 15% of the difference between the itemized deductions and the standard deduction. In this case it equates to 9.9% of your mortgage interest. Ok, now lets project this over the future 30 years of your mortgage. I'm going to assume arbitrarily that inflation of home values, income and standard deduction are all at an average rate of +3% annually. Of course I don't know if inflation, home values or incomes will go up at a 3% rate or not but I'm just making an assumption for the example sake. If you continue to have the same mortgage, 1% property tax and 10% of your income go to charity & state income taxes over the years then gradually over time your property tax, charity & state tax amounts will go up but your mortgage interest payments will drop as you pay down the principal. At the same time the standard deduction is going to increase with inflation. 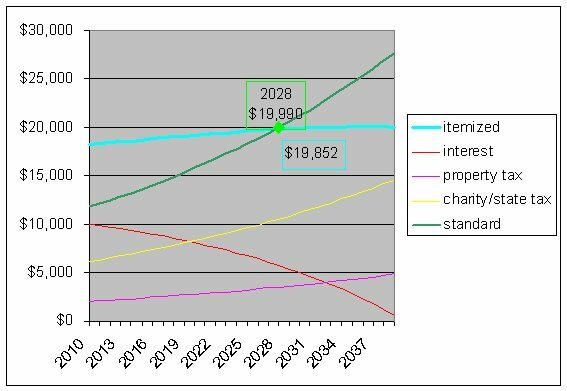 Here is a chart showing the projected amounts you'd have for mortgage interest, property tax, combined charity & state tax as well as the standard deduction and the sum of the itemizable deductions. 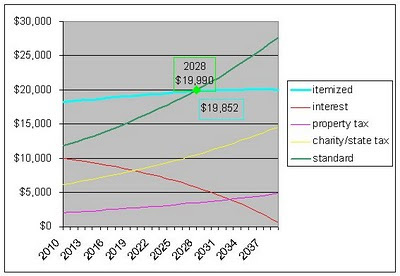 The green line is the standard deduction. The cyan line is the sum of the itemized deductions. You can see that in about 18 years the lines cross and the standard deduction is higher than your other deductions. After that point for the last 12 years of the mortgage you would have NO tax savings from your home mortgage interest. 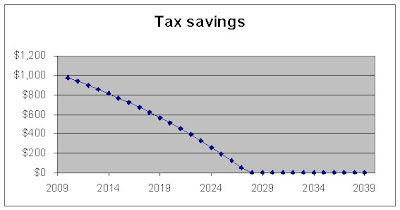 If you sum up the total tax savings it is $10,125. The total amount of interest paid on the mortgage over the full 30 years would be $190,309. This means that you'd only get back about 5.3% of your mortgage interest in tax savings over the course of 30 years. At first glance if you're in the 15% tax bracket then you might easily conclude that you'll save 15% of your mortgage interest via tax deduction. But in this example your actual accumulated tax savings is only about a third of that and your only get back 5.3% of your interest payments via tax savings. Of course this is all built on a theoretical example with specific assumptions. If you change any of the variables then the exact tax savings would differ. For example if you have higher state taxes and charity deductions then you may always have higher itemized deductions than standard deductions. But if you have very little itemized deductions other than your mortgage then your tax savings would be lower. Lets say you make $400,000 and live in California. Your California state income tax alone would be enough to exceed the standard deduction. So you'd see the full amount of your mortgage interest deducted from your taxable income. With $400,000 of income you'd be in the 35% tax bracket on your federal income taxes so you'd get back 35% of your mortgage interest in the form of tax savings. If you you don't have enough to itemize your deductions then you won't see any savings from mortgage interest. If you live in a state with low state income tax and have a relatively small mortgage then it might not add up enough to warrant itemizing. Say you make $60,000 and buy a $100,000 house in Nevada. If your property tax is $1500 and you give 5% of your income to charity then your total itemized deductions would be $5,000 in mortgage interest, $1500 in property tax and $3000 in charity or $9,500 total deductions. That is lower than the standard deduction for a married couple. In this situation you'd get back 0% of your mortgage interest in tax savings.